Everyone at the Rocking Z wears two hats - one for working on the ranch, and one for working on the guest ranch. Usually we operate under both of these hats at the same time, but this area is focused on giving you insight to what the ranch hat means. With 75 horses, 45 head of cattle and multiple dogs and cats, there are a lot of chores to do. In the winter, all the animals need to be fed daily. In the summer, all the animals need to be on good pasture and the pasture needs to be managed. Additionally, hay must be grown, irrigated, cut and baled to prepare for the coming winter. All jobs on the ranch are seasonal, but the core remains the same; animals need to eat and be safe, and so do people. Montana is beautiful, but where we are there isn't a lot of rain. That means that making sure water troughs are filled and that irrigation is working are high order tasks. Every morning starts with feeding the animals that are corralled, and a cup of coffee. 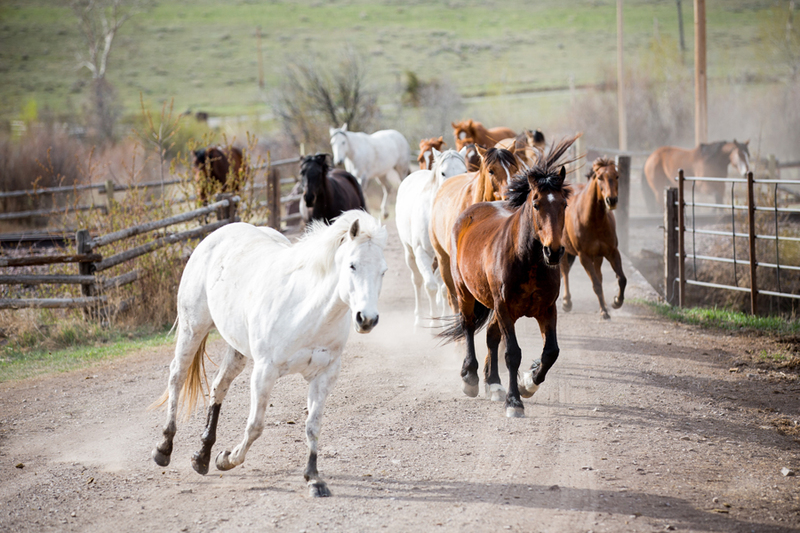 Then the herd of horses must be brought down to the ranch from up to three miles away. We ride out each morning to collect them and herd them home. Guests accompany us sometimes, as long as we've kept in one of our super solid horses that are confident with horses running around them. Then everyone eats breakfast and horses are caught and saddled for the day. At that time Zack's crew are building or farming, and Patty is organising important things like food and menus. Then it's guest time! In the evening, we feed everything again and chase the herd back out to grazing overnight. That's when we take care of odd jobs, like tack repairs or minor fence-building. No matter what the weather does, the herd must be fed. We use our Belgian draft team to pull the wagon or sled to transport the hay from the stack out to the fields of horses and cattle. 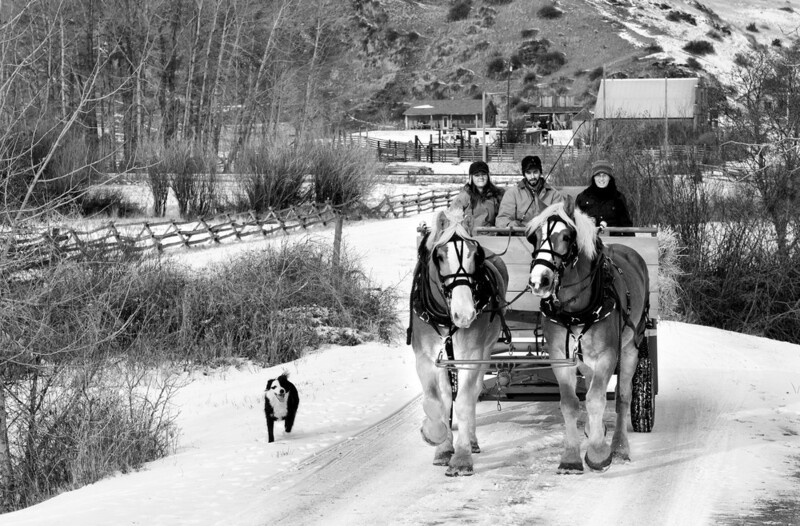 Horses, unlike trucks, start and work no matter how cold it gets! All the animals near to the ranch or in the corrals are fed morning and night. At this time of year we have few guests, so when chores are done we do large maintenance jobs, for example, remodelling the lodge kitchen, or building a brand-new fodder and shoeing facility.